New research has identified the North Atlantic Oscillation as a potential predictive tool for managing North Atlantic cod. 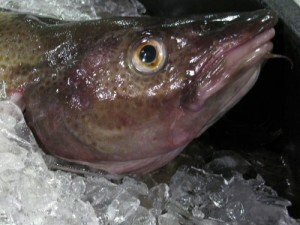 Historically, Atlantic cod (Gadus morhua) comprised one of the most important fisheries in North America. Atlantic cod stocks off the coast of New England have a long history of population fluctuations. Since the 1980s in particular, cod have declined dramatically. In 2008, a formal assessment forecasted that stocks would rebound, but by 2012, they were once again on the verge of collapse. Two years later, the National Oceanic and Atmospheric Administration instituted an unprecedented six-month closure of the entire Gulf of Maine cod fishery to allow stocks to recover. The NAO is a periodic climatic phenomenon that, like El Niño, causes changes in water temperatures, although the mechanism is different and the NAO affects the North Atlantic rather than the Pacific. Also like El Niño, the NAO may be affected in terms of both strength and frequency by climate change. The researchers found that, since 1980, NAO conditions have accounted for up to 17 percent of the decline in New England cod stocks. Because the cod stock is well defined over a large but specific area and has been studied extensively for more than a century, the researchers had access to abundant data. This enabled them to determine that warmer NAO conditions reduced cod larval recruitment by 17 percent, resulting in fewer young fish. They also found that while the NAO-induced population decrease persisted until the fish were 6 years old, it affected cod catch for up to two decades. That empirical link means that NAO can be used to predict the future size of the stock, which would allow for improved management.